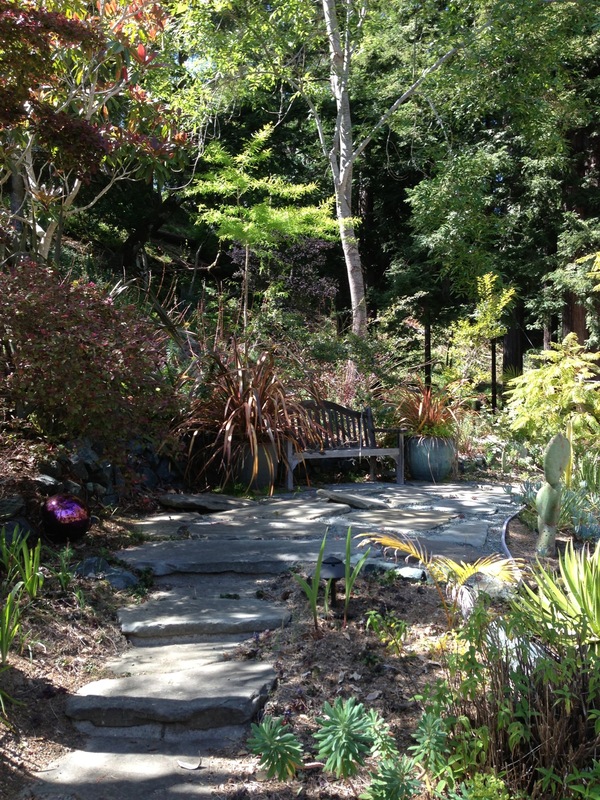 Spring just wouldn’t be the same without a visit to Doc Hencke’s garden in Scotts Valley. I think of it as a learning experience at his personal arboretum, outdoor laboratory, propagation field trial and stunningly beautiful landscape. 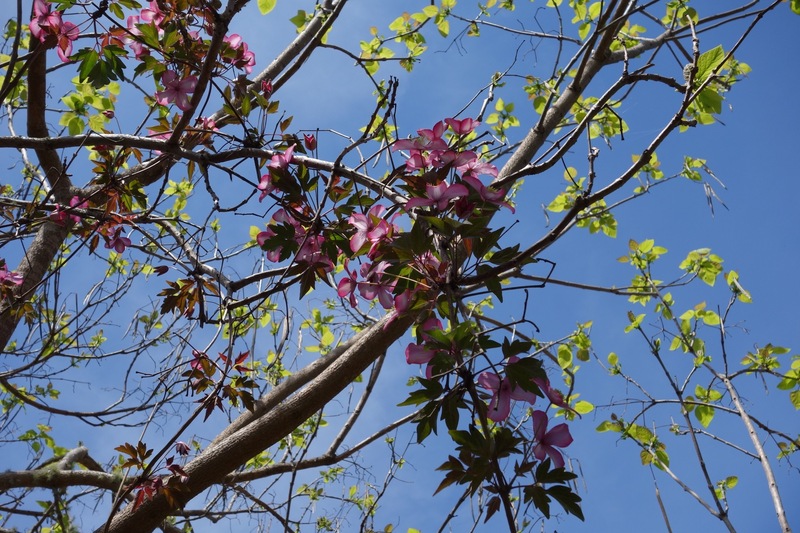 At every turn colorful vines bloom high up into the trees he has collected and nurtured from his travels. Richard Hencke is a walking encyclopedia, energetic and funny while sharing his knowledge and stories about each and every plant. Here are just some of the highlights of this year’s visit. The definition of the word arboretum describes Richard Hencke’s garden perfectly. It’s a place where an extensive variety or trees, shrubs and herbaceous plants are cultivated for scientific, educational and ornamental purposes and my tour this year started at a tall California native Flannel Bush which he had to rope to the ornamental iron fence after it blew over in that wind storm a month ago. Looked to me that his efforts to save it will be successful and if anybody can it will be Doc Hencke. Explaining that the soil in this part of his garden is blue hard sub soil and has taken it’s toll on a couple other plants. One of his Eutaxia obovata also called the Bacon and Eggs plant was just going out of bloom but 2 others nearby have suddenly died. Quite the loss as this shrub is one of those plants that really gets your attention when it’s covered with thousands of golden pea-shaped blossoms. Next on the tour came the straw bale veggie garden. Since the soil in this sunny spot is also sub par this method of cultivation has been a real success. Richard told me that when the bales were first put in place he watered them thoroughly to start the fermentation process. He used a meat thermometer to check their internal temperature and determine when this process was complete and vegetables would thrive. He then soaked them with liquid organic fertilizer and applied some blood meal to augment nitrogen. His crop of kale, lettuces, spinach, bush beans and cucumbers looked robust and happy. Always the story teller, Richard pointed out a Cantua, the Sacred Flower of the Andes that he air layered to increase his collection. He laughed when he told me of a trip to Peru and the guide who misidentified several plants. Richard had to gently supply the correct name for the species. Also in his collection is an experimental round avocado developed by DT Fleming in Maui during the early 1900’s. 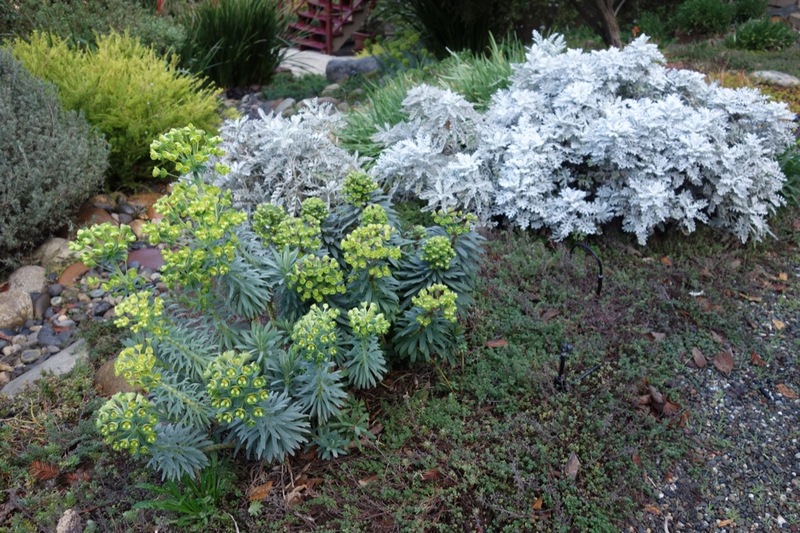 It has survived 3 winters so far in Hencke’s Scotts Valley landscape so he is becoming more confident of its ongoing success. Took Richard quite a while to figure out which was the top of the seed. Being round he had stuck the toothpicks in the sides but put the wrong end in the water glass. He laughed that as soon as he figured out his error and turned it the other way up. It sprouted right away. His Variegated Mint Bush at the edge of the back patio was just completing it’s blooming cycle but still covered with deep purple blossoms. Nearby we stopped at a very large clump of salvia confertiflora starting to bloom with showy red spikes of flowers. Richard lamented that it’s a little too happy. The clump has grown to near invasive size. “Why did I plant this here? Now what am I going to do with it?, he said. This is a good lesson for all of us. The right plant in the wrong place can become a nightmare. His collection of salvias that are planted in the right place include a beautiful salvia mexicana that will soon be covered with rich blue flowers. He also grows s alvia chiapensis and a salvia-like plant native to Hawaii called salvia lepechinia. This deliciously scented plant will be covered soon with reddish lavender lipstick-like flowers adored by hummingbirds like all the salvias. The Hencke garden has a hillside for Hawaiian plants, a slope where he nurtures and propagate succulents, a shade garden for heliconia and houseplants that have adapted to his climate but trees are Richard’s first love. He showed off his hillside that is now home to sugar pine, silver poplar, gingko, alder, New England black cottonwood, tamarix, purple weeping birch and an Oklahoma Wild Sand plum that could win awards for it’s size and beauty. 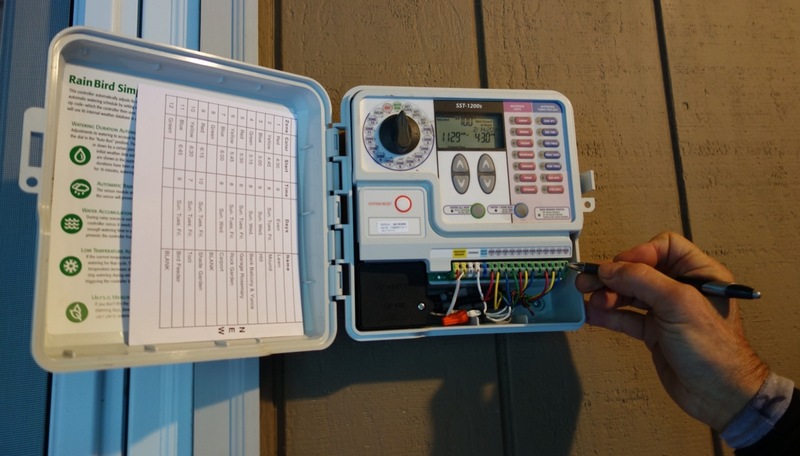 Richard uses a Smart Timer to monitor and control his irrigation. That way he can use the minimum of water that allows his plants to survive. I put him in touch with another local gardener, Robby Frank, who helped him install the system. Gardeners are always pleased to help and share what they know and what they grow. I enjoyed so many more plants and trees in Richard’s garden I could hardly keep up with the stories of their humble beginnings. As usual he packed my car with rooted cuttings and starts of many plants. I’m looking forward to the time when my Sacred Flower of the Andes starts to bloom. Several years ago I was invited to tour a beautiful garden in the hills above Scott Valley High School. Robby Frank was more than eager to share his techniques for gardening in deer country. He was also in a personal battle with gophers and moles and I affectionately bestowed upon him the title, serial mole killer. I am happy to report that Robby has won the war on all fronts. His garden is more lush than ever and with that comes the ongoing dilemma of saving water in the landscape especially in this time of drought. He solved the problem by installing a Smart Irrigation Controller and has been so pleased with the results he’s on a Smart Irrigation crusade to educate fellow gardeners. Here’s his story. We all know mulching is one of the ways to conserve water in the landscape. Robby has long been an advocate of composting and regularly renews the mulch in his garden. He even calls himself “Mr Mulch”. He has permeable paths and a dry river bed that allow rainwater runoff to soak into the soil slowly. He keeps his plants pruned in a naturalistic manner because “smaller plants use less water'”. But all this wasn’t enough. His 3 “dumb timers”, as he calls them, were using too much water. That’s when he started researching weather based smart irrigation timers. 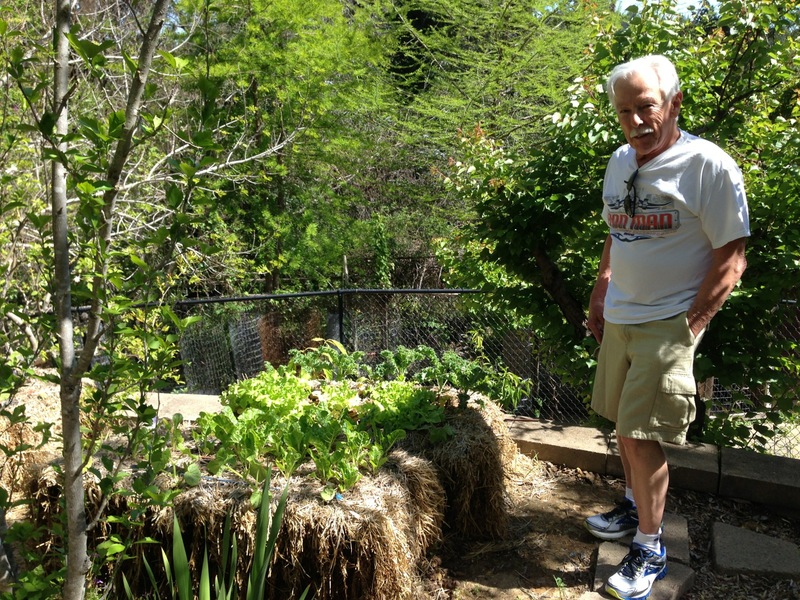 “To me it seemed like an easy way to conserve water and it’s better for the plants as well”, Robby said. “It will increase the irrigation times if the weather is hotter and dryer than usual, decrease if it’s colder and turn itself off if it rains”. Robby was already familiar with the Rainbird brand of controllers although there are many other companies that offer them. That’s why he eventually chose the “Simple to Set” Smart Indoor/Outdoor Irrigation timer or Rainbird SST 1200s. 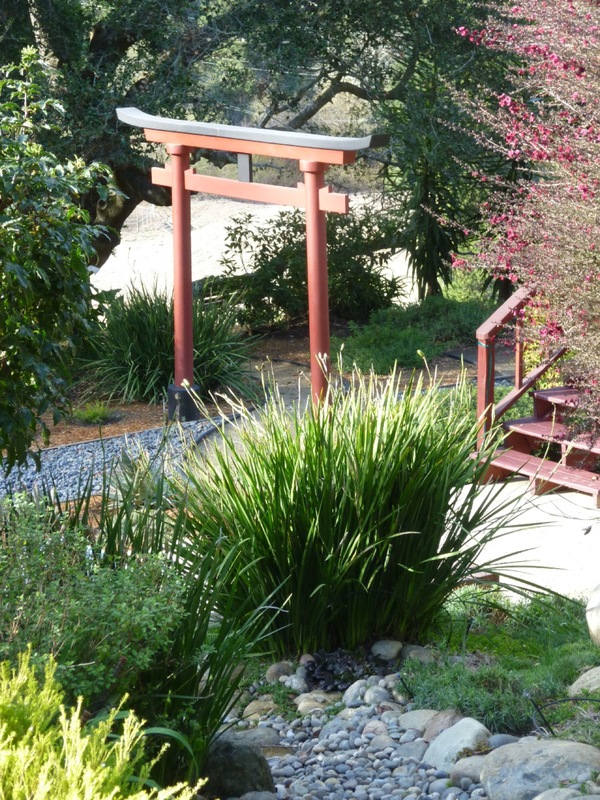 Scotts Valley Water District offers a Landscape Rebate program for weather based irrigation controllers and has a list of acceptable models on their website. Robby paid $165 online for his controller as he couldn’t find a local store that stocked them. Since then he has convinced the local Ace Hardware to carry them. It replaced his 3 old controllers and he received a rebate from the SV water district for $100. San Lorenzo Water District has a similar rebate program. To qualify for the credit, he arranged for someone to come to his house to take pictures of his old controllers. After installation they came again to see the new controller and he completed the necessary paperwork. The rebate credit which can vary from $75-$100 doesn’t cover the cost of the controller or installation labor and is determined by the type of controller installed. You can’t go wrong with saving water, money and getting a rebate, too. The best part of the new system is how it saves water and is better for the plants. The controller is never turned off. You enter your zip code and the watering schedule you prefer and the controller adjust the amount of water either up or down as needed. For instance, when it was dry before the December freeze, the controller watered his landscape at 20-30% of normal so the plants were not totally dry during that week and were better able to stand the extended freezing temps. Likewise, the sensor can trigger the controller to irrigate 130% of normal if it’s exceedingly hot and dry. The controller, also called a timer, comes with 10 years of historical weather data for any US ZIP code and includes a rain and temperature sensor. Robby showed me how amazingly easy it is to set up and program the controller. It’s called the Simple to Set irrigation timer and I agree. 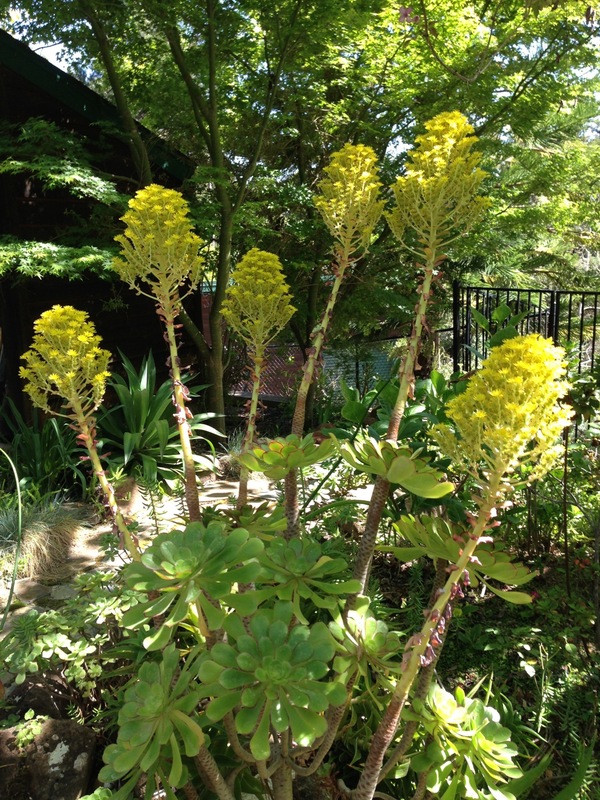 Because he propagates most of his succulents himself from cuttings, it’s easy for him to add a bit of extra irrigation on a one-time or sort term basis until they become established. He couldn’t do that with his old timer. It had to water the whole area on a valve the same. 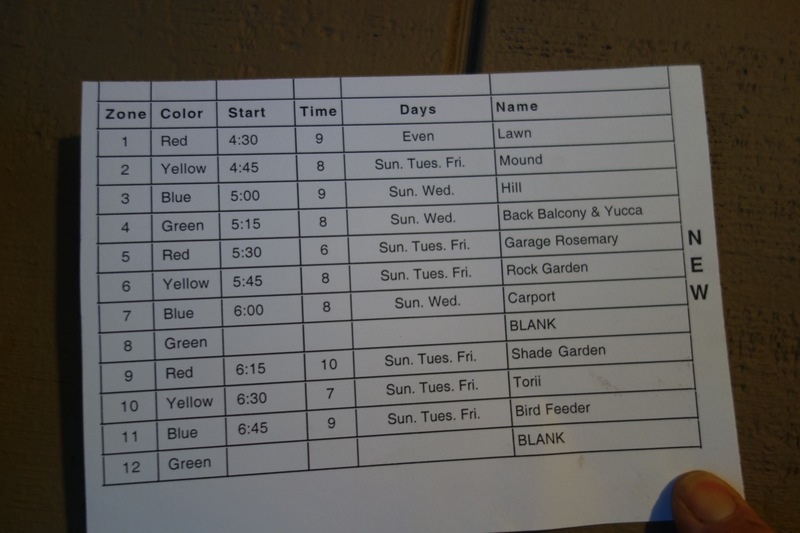 Now he has 12 zones that he easily programmed for just the right amount of water whether it’s several times a week or once a month. Robby Frank is on a crusade to save water and Smart Irrigation is the way to do it. If you want to read more about how he battles deer and moles you can access the story I previously wrote about him on my blog by searching Serial Mole Killer. He would love to find other local like-minded gardeners to share stories.